Gwen Hamlin & Don Wilson cruise aboard Tackless II, a CSY 44 Walk-thru, 44' cutter hailing from St. Thomas, USVI. 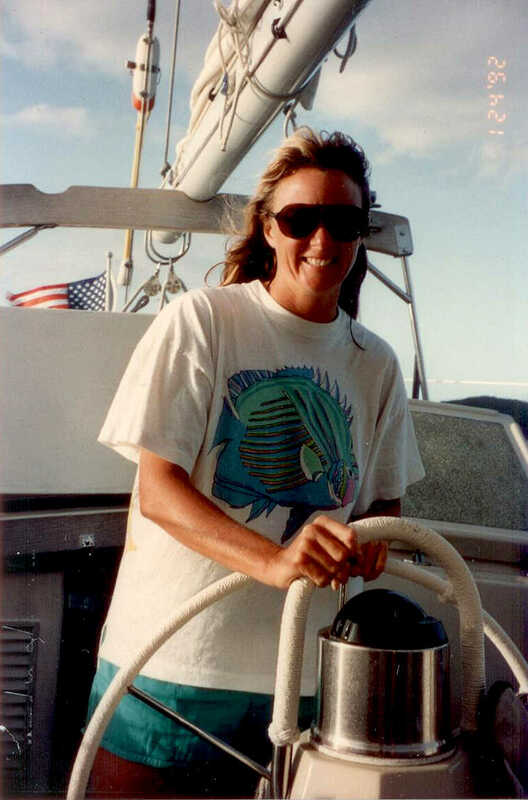 Gwen spent 1988 - 1990 as a dive instructor and first mate on a liveaboard dive boat, 1991 - 1999 as owner/operator/captain/chef of Whisper, a dive/sail charter yacht in the Virgins Islands (including several down island trips) and 1999 - 2009 cruising aboard sv Tackless II. Over they years they cruised the Virgin Islands, Eastern Caribbean, Southern Carribbean, Colombia, Panama, Ecuador, Galapagos, Cocos, Panama again, Costa Rica, Nicaragua, El Salvador, Mexico West Coast including two summers in the Sea of Cortez, and then five years across the Pacific to Australia (nine months in French Polynesia, one year in Tonga, and one year in Fiji). You can read more about their cruising lives on their website. Gwen is the author of the Admirals' Angle column in Latitudes & Attitudes magazine. They have sold the boat in Australia and have settled in Tarpon Springs, FL for family time. They started a new business that is a mobile espresso café...sort of a Starbucks on wheels. They can also be contacted via email (info@cafe-getaway.com, admiralsangle@yahoo.com). It would also be nice to know that most of the things you are liable to worry about before leaving won't as big a concern as you build them up to be. Foreign peoples are not out to get you and weather, if you plan prudently, is not liable to be horrible. On the other hand, the best kept secret about the Pacific is its preponderance of blustery squalls and confused seas. Very rarely is it the rolling 15 knots you imagine. Downwind sailing is not all it is cracked up to be, especially in confused seas. It is hard on your posterior! Quite a bit. The biggest change is communications. Email was just getting going about the time we left. I got my ham license in Trinidad, and radio email turned out to be a hugely important asset for us while cruising. Five years into the 10 year trip we added a Satellite phone which we had shipped to us in Samoa at which point radio connections were not as good. It would have been comforting to have had on the crossing, especially for weather downloads. Our last few years, were able to get cellular broadband in Fiji and in Australia. This brings in the Internet and Skype. How incredible to be sitting at anchor in some remote spot and be able to upload and download or chat with family. In Australia we watched our grandson open his Christmas presents. Also, electronic charting was just getting established when we were setting out. We used both computer based navigation and later a chart plotter. Wouldn't leave home without either. Ironically, after being a charter boat for 8-9 years and having guests professionally, we had relatively few while cruising. I did an Admiral's Angle column on the subject which is available on Women & Cruising. My best advice is to be very sure you want to commit to being somewhere you aren't already. Trying to make a scheduled rendezvous cannot only expose you to having to move in bad conditions, but you might not be ready to move on from where you are. Plus having guests in a place you’ve had some time to get to know will make a better trip for your guests. Respect both the rules and the customs of the country you are visiting. It is very easy to persuade ourselves that our floating community is exempt or above the local laws. Not only is this rude, it can ruin things for cruisers coming next. Many rules (like dogs going ashore) have reasons for being that we can't see. And there is nothing that is ruder than filling your boat's freezer -- lobster or fish -- from one island's ecosystem. Take what you need for a night or two, and leave the rest. Don’t be selfish! My first offshore trip was eight days from Ft. Lauderdale to the Virgin Islands in my newly-purchased boat (Whisper-CSY 44 wal-over) that I aimed to put in charter. I hired two experienced friends to come with me and an inexperienced friend across the Gulfstream, through the Bahamas and the down "I65" right to St. Thomas. That trip predated affordable GPS, and we were relying on the intermittent updates of SatNav. We had a smooth trip with knowledgeable people to help with the few issues that came up (my friend was seasick the whole way and couldn’t always stand his watches, and that was an easy watch schedule; autopilot failure solved by rigging the Aries; ran out of fuel when we failed to switch tanks in time and so we learned how to bleed the Perkins!) I still remember the foolish thrill of arriving exactly where we were supposed to be! From there, I (and later we) gradually built up our experience (and equipment) with trips through the years between the islands, then overnights, then 2-3 night passages and finally onward to the Pacific crossing. I think for both Don and me, anxiety about potential problems was always greater than reality. Fortunately, we both subscribe to the take all precautions every time before trouble raises its ugly head (a lesson we learned living in hurricane territory!) That's why we have had very few bad moments. Our first really nasty thunderstorm -- coming in a huge ink blot off the coast of Colombia during a night passage -- was pretty tense, especially as we were sailing with four other boats. Would we lose track of them in the melee...and the spreading blob of green on the radar?! Between us, we did all the right things, reefing way down before it hit, ensuring every hatch was securely dogged, harnesses clipped in, radar adjusted, etc. In all those few stressful moments, we seem to put emotional reaction aside until later. Oh, come to think of it, the scariest moment was a bar crossing out of Altada in Mexico when a big wave rose up and dumped on our deck, drenching the cockpit and skewing us all around in the narrow channel. The GPS and its nice little sequence of waypoints were all askew. I had a flash of the boat put on the shoal and pounded to matchsticks (or whatever fiberglass pounds to!). Fortunately, we carried on and it was all over after that one wave! But, even when carefully prepared, stuff can come out of nowhere. And there was the time our reefing line on the genoa chafed through. We were tripled reefed with staysail and had but a handkerchief of headsail out as we were crossing an underwater ridge formation on the approach to Australia. The seas were short and steep, and that handkerchief of headsail translate to a lot of forward way, but it was not a good time for the full 110% sail! It's very easy to say we should have had the pin in the drum as Harken recommends, but those conditions are not the kind anyone really wants to go to the bow to either put a pin in or to take it out again when you want to get furl the rest of the sail in entirely! We hove to, and waited til daylight to drop the sail. An anxious few hours in big seas. But HEAVING TO WORKS!!!! 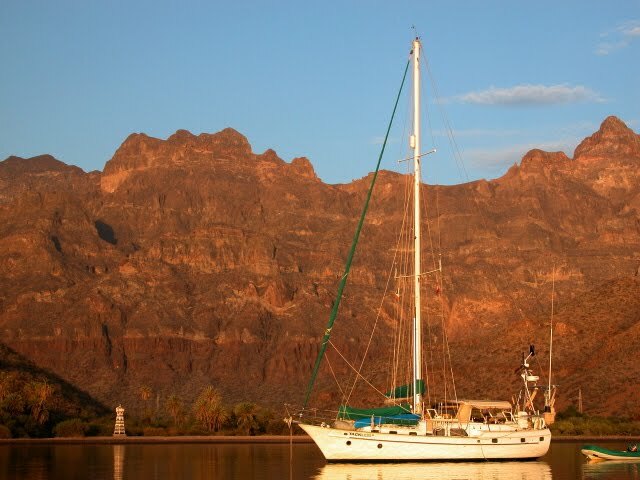 Thanks to our years chartering, a few interisland trips and one season cruising in the Eastern Caribbean before taking off, we had a pretty good idea of the things we wanted aboard. And we spent the $ to have them: good sails, a stout electric windlass, big anchors (and several spares), the integrated instruments, radar and chart plotter, an email ready SSB, and a wind vane steering gear. We also had some luxuries: the Minus 40 chest freezer, the Splendide washer, the breadmachine, the dive compressor...all of which we loved having. Taking time to see what you really need. I wish we had set the boat up better for downwind sailing. And I don't mean a spinnaker. That was a huge waste of money for us. The margin between enough wind for the spinnaker and enough wind for the poled out genoa was very small, and having that big sail up was stressful. Why waste the money and $, not to mention space aboard. We sold it in Tonga and were thrilled to get the space back. Perhaps, as it turned out, one of those storm jibs that slide up over the headstay would have been a better investment. But a double headsail rig with two poles on the mast like the Amels have, or some kind of set up with double staysail (we saw a boat with such a set up and it seemed ingenious) would have been neat and much more manageable than the spinnaker. Not as pretty though. We often thought about swapping our self-tending staysail (on a boom of its own and necessarily raised at the mast) for a roller furling one, but, I don’t know, that staysail worked mighty well as it was. I like everything about the cruising culture. The friendships you make are the best ever. The support -- moral and actual -- that you get not just from friends and acquaintances, but complete strangers always boggles me. Ditto the warmth, kindness and generosity so quickly and genuinely extended by locals who often have so much less in material comforts than we. I was not the one who was ready to get off the boat. Rarely, I see cruisers abuse those kindnesses, both from other cruisers and from locals. I don't like that. We once knew a cruising boat who never had spares because they knew they could get what they needed from someone better equipped! That's poor cruising etiquette. And again, when I see cruisers disregard local regulations and customs. That makes me uncomfortable. Like walking around town bare-chested or in bathing suits when local custom calls for having shoulders and thighs covered (not just the Pacific, but Caribbean towns too!) And careless anchoring -- for other boaters and for the ecosystem below. Fortunately, this is rare among real cruisers. Even that one is hard to answer. But I guess our favorite place was Mexico. All the more special for the fact that Mexico was not in the original plan. It was a turn north inspired by the West Coast cruisers we crossed paths with in the Southern Caribbean and Panama on our way to the Canal. We'd enjoyed Central America along the way, but when we crossed over into Mexico, it was hard to believe the change, evident particularly in the food! We loved almost every place we went, but most particularly the Sea of Cortez. It was a surprise that we loved it, because the water isn't gorgeous: it's cold until July by which time the air is really hot, there's virtually no coral, and there are often stingy things necessitating at least a Lycra suit all the time. In the summer months, most all the cruisers leave, returning to California or hauling and storing their boats in San Carlos. But for those who stay, you have this awesome playground of dramatic desert landscapes with very little sign of man, and an underwater world that is full of life: whales spouting by, sea lions frolicking, mobulas (small manta ray-type rays) popping out the water like popcorn, dolphins arcing, even whale sharks. For the first time in our lives we actually learned to spearfish and collect clams and scallops, catch fish from the dinghy, and troll productively from the boat (I even hooked a sailfish accidentally...when I was singlehanding and hoping for a mackerel!... But that's another story! )...or these three-foot long squid that sluice you like water cannon as you try to land them. Yes it is hot, Hot, HOT, but you learn to take siestas midday, swim in the mornings and afternoons, and eat and socialize in the evenings. And yes, it is hurricane season, but the radio nets are active with good weather, and there are good hurricane holes for those who are properly prepared. We got run over once by Hurricane Marty, but the twenty-six boats taking refuge in Puerto Don Juan were organized and ready and suffered no damage!) And what's not to love about the staples of Mexican cuisine: homemade tortillas, avocados, cabbage, tomatoes, and cilantro available in almost every town (we made our own version of fish tacos nearly every day), a broad selection of great beers and all the makings of margaritas, which taste awfully good of a Mexican evening as the stars glitter unimpeded in the night sky. WE lucked into a really special small group of cruising friends with whom we came and went and played a lot of cribbage. It was outstanding. All that and ashore, the inland travel was so rich, the Spanish and Mayan cultures, the elaborate churches, the pottery, the ruins. We traveled inland to the Colonial heartland, Copper Canyon, and Oaxaca, as well as, of course, all the coastal cities. The people everywhere were always friendly and welcoming, and for me there was the fun challenge of teaching myself Spanish. I love language, and Spanish is a fun language to learn.